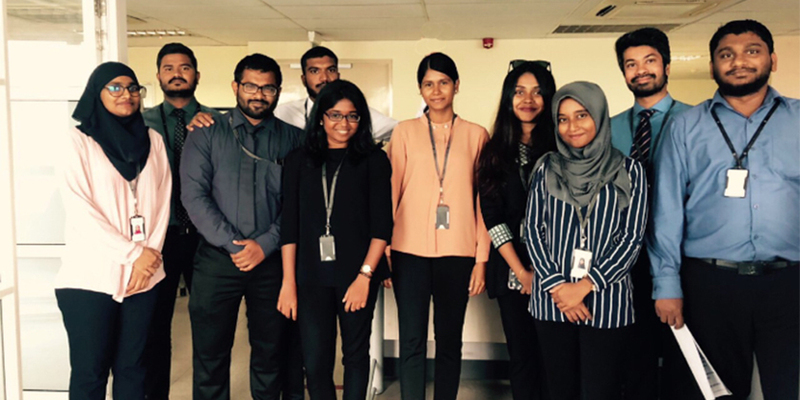 Current year 2 student from the School of Economics shares her experience of an Internship at the Maldives Monetary Authority. Over the last summer break, following my first year, I have had the incredible opportunity to work at the Central Bank in the Maldives. I worked in the Statistical Information System (SIS) Section of the Statistics Division. A typical day consists of compiling and analyzing data. These include compiling and validating the Monthly Statistics publication of the bank. The components in the Monthly Statistics include four sectors: Real, Fiscal, Financial and External. During these two months, my main focus was on the Financial and the External Sectors. In the Financial sector of the Monthly Statistics, I learned about the Monetary Aggregates, which gave me an insight into how the money supply was controlled in the Maldives to maintain monetary stability. It also helped me to reflect on the modules I studied during my first year as an undergraduate, which broadened my interest to learn further. I analyzed the External sector of the Monthly Statistics with the internal resources at the bank. It sparked my interest to find out about the magnitude of the changes in trade patterns over a period of time. I presented the trade patterns in the Maldives. Mainly, I highlighted the changes in the composition of imports and exports, connecting with the changes in direction of trade over time. I also participated in conducting the Maldivians Travelling Abroad Survey, which was done to study the expenditure patterns of Maldivians’ outbound travel required for the Balance of Payments Statistics. Related to the Balance of Payment Statistics, I also assisted in conducting the foreign investment survey, aimed at estimating direct investment and foreign assets and foreign liabilities of the Maldives. One of the main highlights of the internship includes learning a programming language called ‘R’. It is a useful software for statistical computing and graphics. With the help of my colleagues and the learning resources provided, I was able to learn some basics and apply it. It is one of the things I am keen to learn during the spare time. During the two-month internship, one of the main challenges I faced was the fear of giving presentations. I was anxious about public speaking; this is not helped by the thought of presenting my work to the senior leaders of the bank. However, I came to realize that they would not expect perfection, and this amazing exposure allows me to develop presenting skills at such a young age. One thing I want to pass on to anyone about to begin looking for an internship is, no matter how new you are, you can go after the big projects. Do not think that you are limited to the small tasks that are assigned to you. That is one way of learning and making the most of the internship. I would highly recommend everyone to pursue an internship, especially after the first year. Because it guides you into choosing your path of interests when choosing your modules in the second and third year. Perhaps, the experience might open you to higher levels of job prospects when you graduate. Last but not least, I am thankful to the Maldives Monetary Authority for accepting my application and broadening my exposure in the real world of economics. Thanks to the Statistics Division for teaching me so much that I will be able to apply myself in my future career after graduation. For more information, please contact Fathimath Fainaan Waheed.